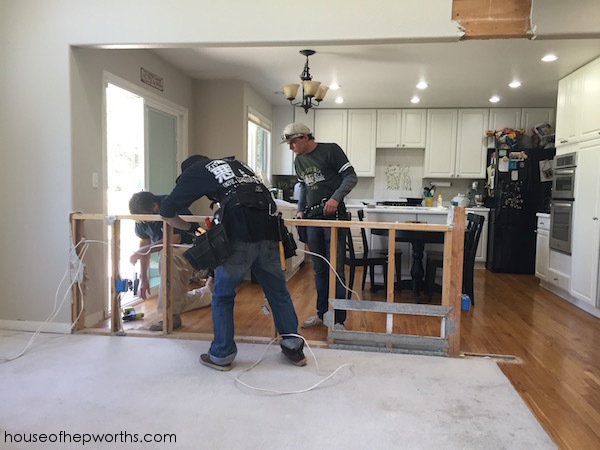 We want to get rid of all the carpet on our first floor and install hardwoods. Because half our first floor is already hardwood, they will patch the old floors with new hardwood. 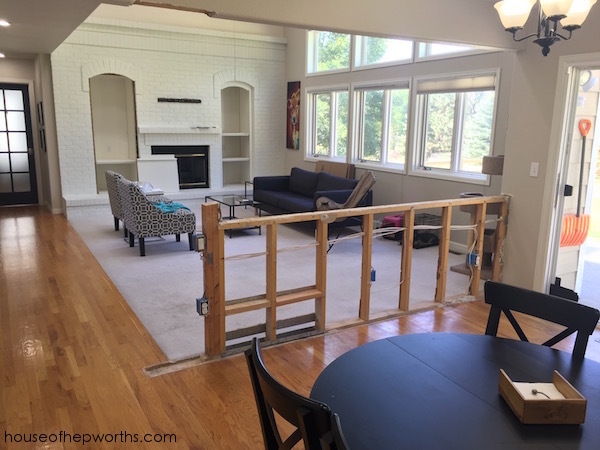 Currently the family room, formal living room, and dining room all have carpet, so we will tear that out and weave in new hardwood floors. 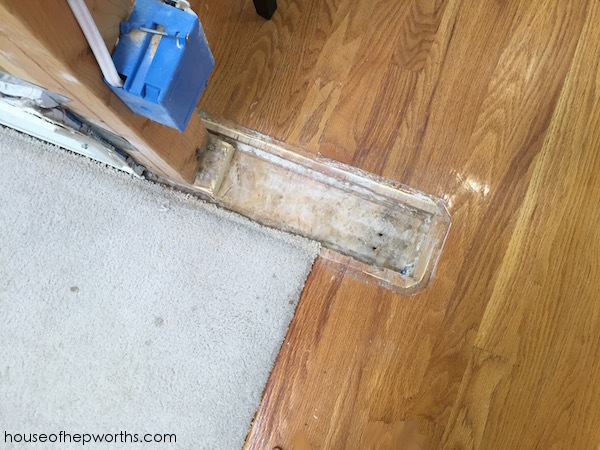 Before we start weaving new flooring into the old flooring, there are a few areas that we want to change up. 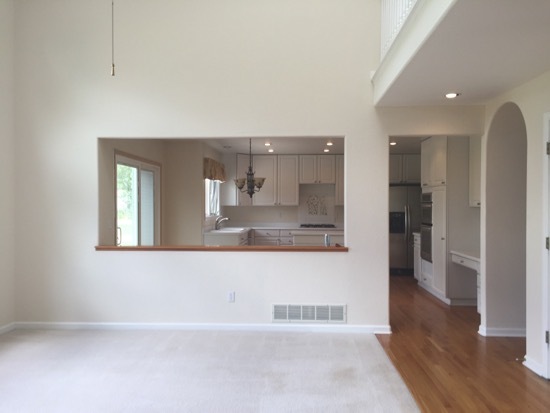 One of those areas is the half-wall between the kitchen and family room. 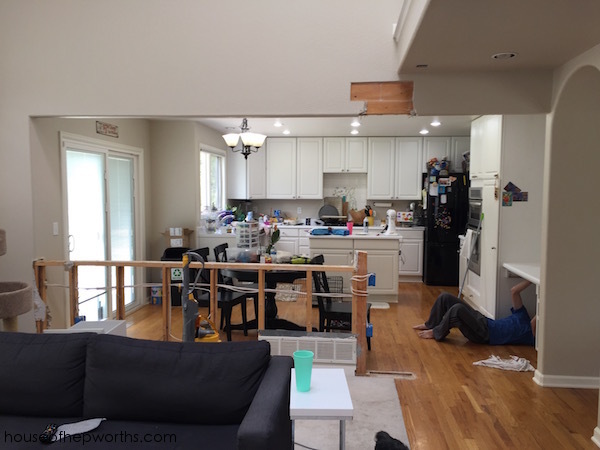 We want to take the half-wall out to create a more open space between these two rooms. 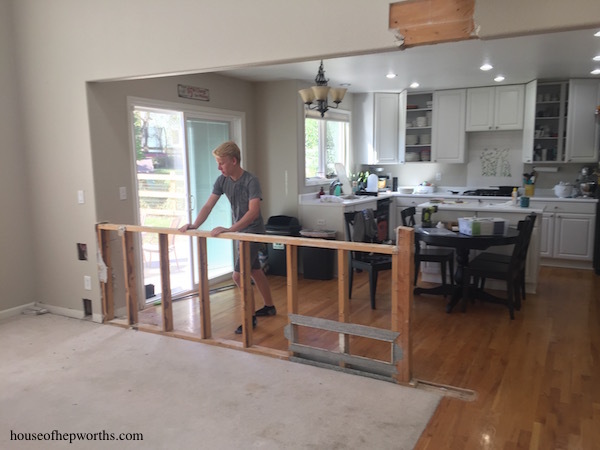 We love entertaining, so to make the house more open and user friendly when there are lots of people over, this half-wall has to go! In my last post, I showed you my son pushing over the wall. That was an exciting day! First, we had to make sure the wide column wasn’t load-bearing. If it was, then our entire plan for our new kitchen would be ruined. 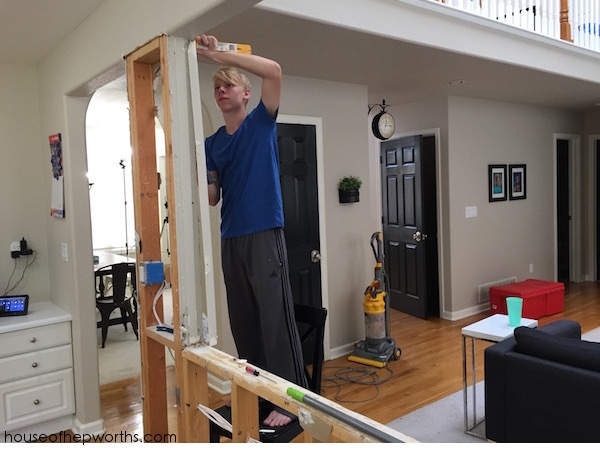 We hired a Structural Engineer to come to our house and make sure the column wasn’t supporting the load of my son’s room above it. 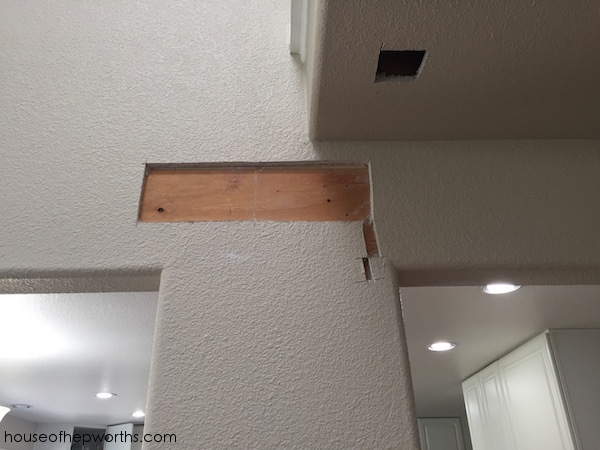 In order to do that he cut several holes in the sheetrock. He also did LOTS of math and measuring. He went in our basement and took measurements. He went in the attic and took measurements. After about an hour of number crunching and measuring, he concluded that this column is definitely NOT load-bearing. What a relief! After lots of dust and about an hour, we could see through the wall. Do you even know how exciting it was to be able to see through that wall? So freaking exciting. 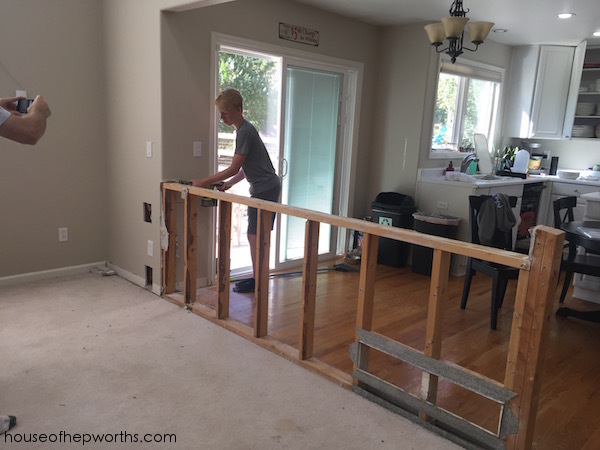 For the first time, I could step back and really start to see what this space will look like when it’s finished! I may have taken 50 photos of this wall. I was like a kid in a candy store. Well, we weren’t done yet! I busted out my Ryobi reciprocating saw (and battery), taught Travis how to use it, and he went to town. Using a reciprocating saw is the ultimate power tool rush! Out with that column. Good riddance. You will not be missed! We removed as much of the column as we could without messing with the electrical. You can see where the flooring people will have to weave in the new floor. Next up, the electrical. I can do basic wiring, but the electrical on this wall included two light switches and 3 outlets on two separate breakers. There is no way I’m going to attempt to mess with this, so I called in the big guns. The electrician came out and after about 3 hours they had all the plugs and switches moved to better locations. And finally, no wall. NO WALL! Later we will have an HVAC guy out to figure out that intake vent in the floor (under the piece of wood). We put the piece of wood down so no one would fall into the hole in the floor. 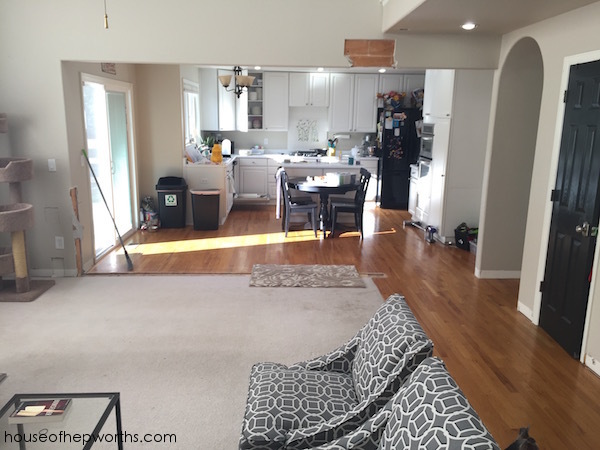 Can you believe how much larger this space feels? I can’t. Seriously. It’s like a new house. Wowza. You can actually breathe in this house now. I can SEE the kitchen from the family room. 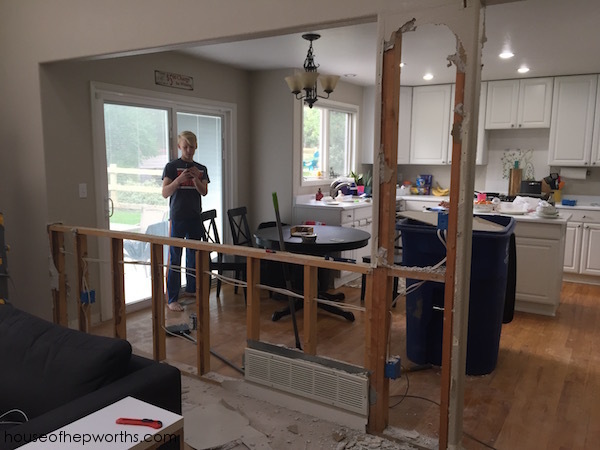 We are going to install a HUGE island in the kitchen, so removing this half-wall was imperative. Just try to picture a huge island and tons of people standing around it. The parties we will have… I can’t even. I just can’t contain my excitement! The excitement can’t last long though because we are on a time crunch and that brick wall and hearth in the living room needs to come down! 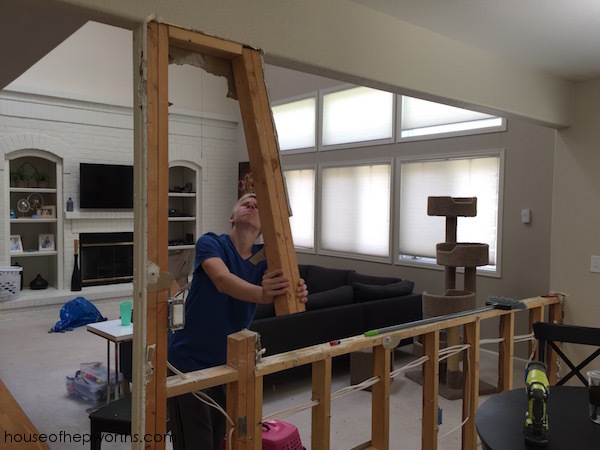 Next up, tearing out the fireplace wall (that I JUST painted! Sigh.) I will be worth it. I promise. 🙂 Check back Monday to see us tearing out that brick. 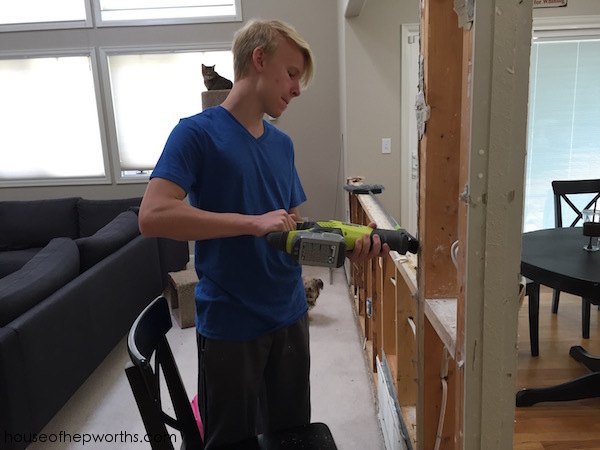 « Let the whole-house renovations begin! 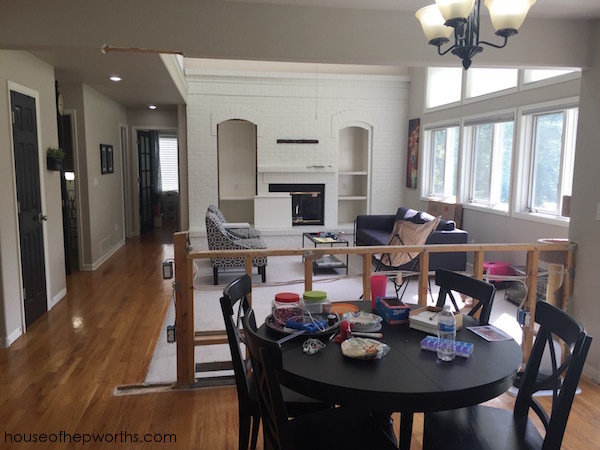 Wow – what a great before and after! 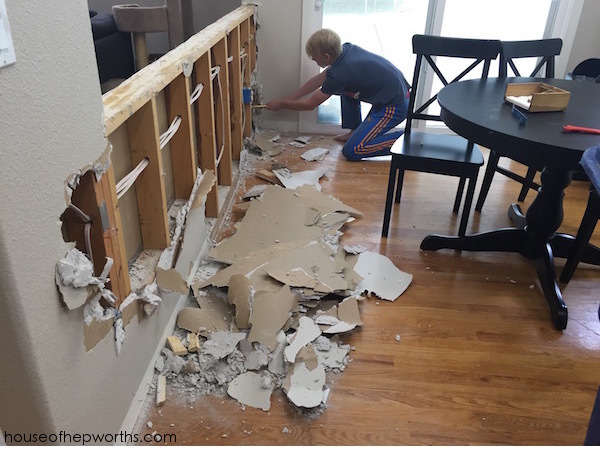 We took the half wall out between our kitchen and family room a couple years ago and it was one of the best things we ever did! 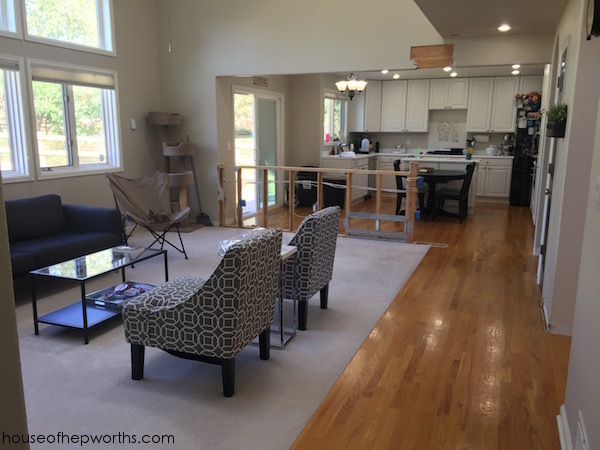 Enjoy all the open space and light! Wow! What an amazing difference!! Looks so much better already! Awesome!!! 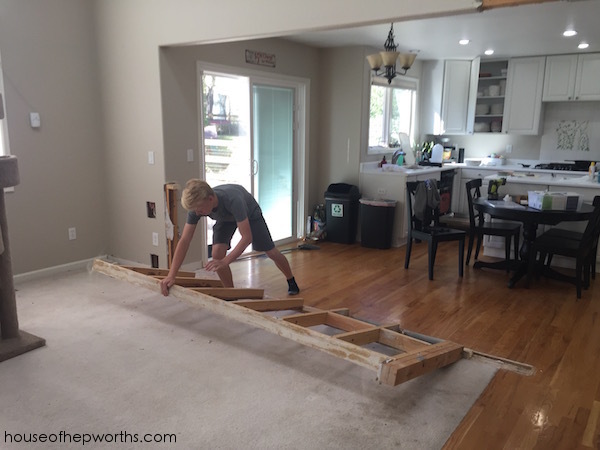 I really want to do something similar, but I’ve seen 2 neighbors add more hardwood (one was a step up dining room area and one was just taking up carpet in the family room area, next to the kitchen. 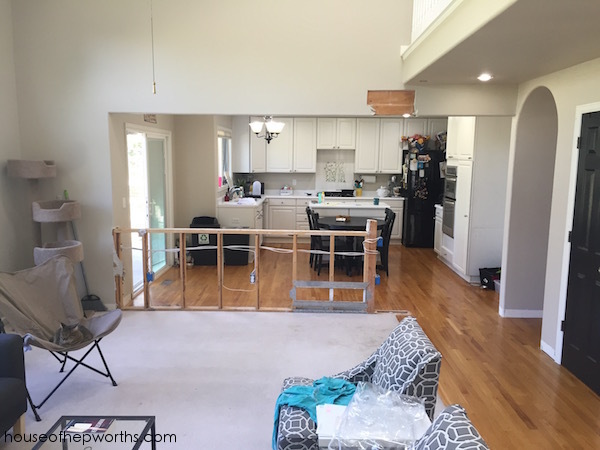 I have to say (NOT to scare you….and I know from your past remodels, you’re picky as I am) – they looked awful! Like, I thought “am I the only one seeing this??? 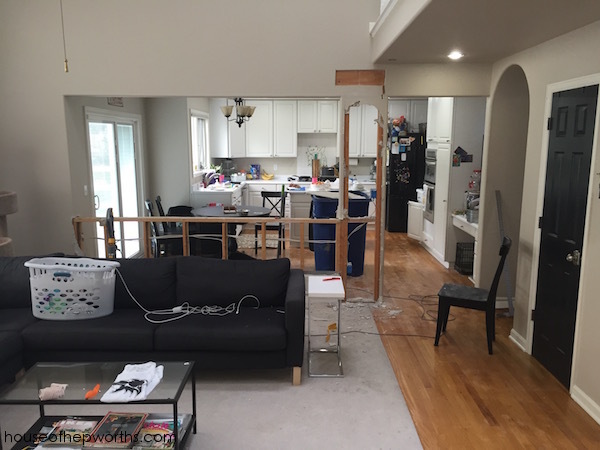 ?” One had the hardwood going in another direction, which there was some explanation for, but dude….I’d spend the money to make it look good, or take a pass. And the other…the color just looked off. So I’m a little scared of it. I’m going to be watching, fingers crossed. but you look like you’re on a good roll!